The pileated woodpecker is the largest woodpecker in North America. That is unless you believe that the ivory billed woodpecker, which has not had a verified sighting in about 40 years, is not extinct. they are found in wooded areas of the eastern half of the United States, the Pacific Northwest and the boreal forests of Canada. They prefer an old growth forest habitat with a good number of larger trees. They are non-migratory and stay on their breeding territory all year long. They are very defensive of their territory and will often drum, pound their beaks loudly on a hollow tree, to warn other birds to stay out. They also have a loud call, that sounds like laughing or cackling, that can also be a warning to invaders. During the winter they are a little more forgiving and will let other pileated into the territory to feed. 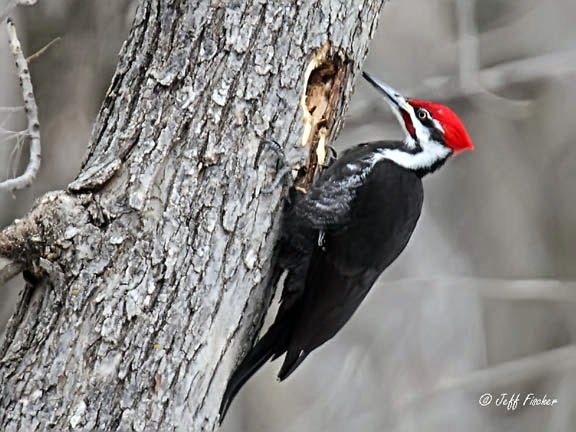 Pileated woodpecker primarily eat ants and wood boring insect larva. They do this by excavating large holes into trees and then using their long tongue to slurp up their prey. 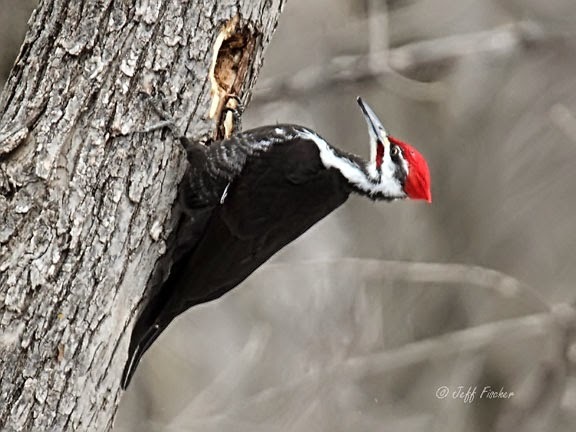 Pileated excavations are easily identified because they are typically larger than other woodpeckers and often somewhat rectangular. 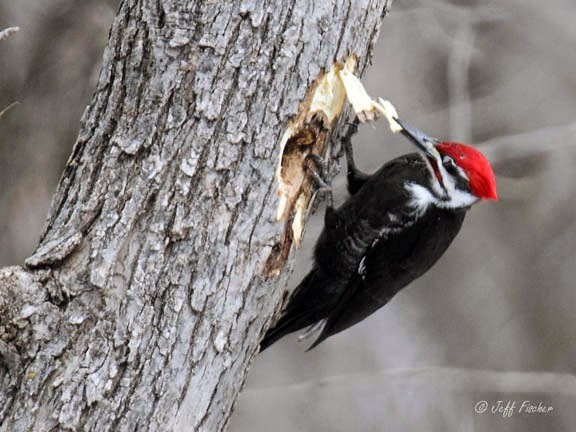 Frequently song birds and smaller woodpeckers will feed inside pileated excavations. They will also eat fruit, berries and nuts. They will sometimes forage on the ground through dead leaves or on fallen trees, where there are a lot of insects. If you are lucky they may even come to a suet feeder, especially during a rough winter. Pileated begin nesting in April. The male will make a nesting cavity, usually in a dead tree, in hopes of attracting a female. It can take weeks for him to excavate the cavity. The hole to the cavity is an oblong shape and the inside is unlined except for leftover wood chips. Pileated typically have one brood per year which consists of a clutch of 3-5 eggs. Both parents incubate the eggs which take between two to three weeks to hatch. Both parents care for the young which are born helpless and without feathers. After they raise the young the pileated woodpeckers abandon the nest. They will not use the same nest again in the future. These abandon cavities provide nesting habitat for many other types of birds including wood ducks and owls. Pileated will also sometimes nest in man made nesting boxes. These are beautiful looking woodpeckers and great shots of them. One of my favorite birds of all time next to the Loon and it was not too long ago I actually captured a Pileated Woodpecker at a local park pounding away on a tree not too far from where I was sitting so was able to get a shot of him but, only the back of him. Such a handsome bird. Gotta love how they donate their pre-owned homes. Oh this is my Mom's favorite bird to find. They are beautiful. Wonderful Pileated! I wish the Ivory Billed was still with us, but I have no real hope. That's a new Woodpecker to me. Great pictures. Calling by from ABC Wednesday, lovely captures of the Woodpecker. These are all really great images of the Pileated Woodpecker! Lovely! I've only seen Downy Woodpeckers where I live in Ontario. That is one huge hole he's created. I've seen a couple, but have not been lucky enough to get a photo. Want to earn 100$ daily join this website. Thank you so much for the quick education! 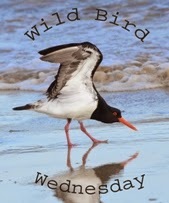 I managed to pull off a few photos of this same kind of bird in the park right next door to where I live!! How lucky was that??? Looking at your Woodpecker photos helped me to identify what kind of Woodpecker it was that I had photographed! I have a real photo hobby going lately!